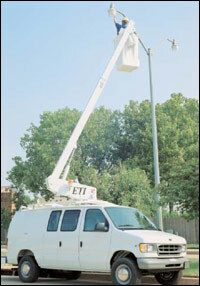 manufacturer of both aerial devices and utility truck bodies. 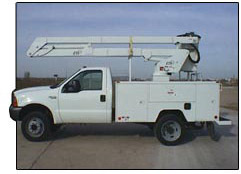 due to the integrated design of the body and the aerial lift. Continuous rotation is standard on all ETA units. Full pressure hydraulic controls located at basket and turret w/ full feathering capacities from both upper and lower controls. Positive chain and rod leveling based on parallelogram system ensuring long life and minimum leveling system maintenance. Internal mounted holding valves (integral part of cylinder) lock cylinders in place in the event of hydraulic failure. Ability to access body compartments from basket. 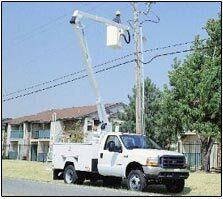 Stowed Height* 9' 9" 9' 9" 9' 9"
Continuous rotation is standard on all ETO units. Shear ball rotation with an extended shaft for manual rotation. Internally mounted holding valves (integral part of cylinder) lock cylinders in place in the event of hydraulic failure. Continuous rotation is standard on all ETO MH units. 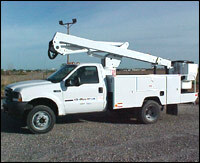 Hydraulic winch & 5 ft. jib -- up to 1,000 lb. material handling capacity. Van mount units utilize a bridge frame in lieu of pedestal providing increased storage capacity and greater accessibility to van interior. Shear ball rotation gear driven by internal drive gear box. Inner boom is actuated by a cylinder extension system. 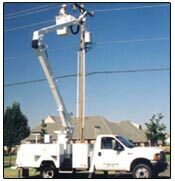 Stowed Height* 9' 5" 9' 6" 9' 6" 10' 6"
Continuous rotation is standard on all insulated ETC units. Hydraulic leveling via master/slave system providing a bucket dump for clean out and operator rescue. Shear ball rotation gear driven by external drive gear box. The gear box has an extended shaft for manual rotation. Hydraulic cylinder extension of inner boom providing maximum clear span of inner boom for insulation. 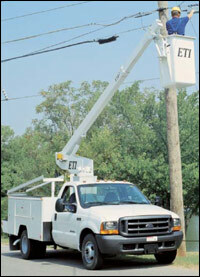 ETI provides a variety of optional features on Insulated Aerial lifts.